History was made on Sunday in the NPCA Super League match between defending champions Stray Lions and Swamibapa as all 10 Swamibapa batsmen being dismissed caught! This was the first time such a feat has happened in the NPCA Super League. Asked to bat on a damp wicket, Swamibapa batsmen kept picking out the fielders as they were humbled for a paltry 101 all-out inside 29.3 overs on their way to six-wicket loss to Stray Lions at Nairobi Jafferys. A mixture of catches were offered to the Stay Lions' fielders, mostly those in close range all in action at various points. Wicket keeper Abraham Vadada was the top fielder with four catches with skipper Hiren Varaiya dismissing three. After asking the hosts start, Stray Lions capitalized on the difficult batting condition to strangle the home team's batting. 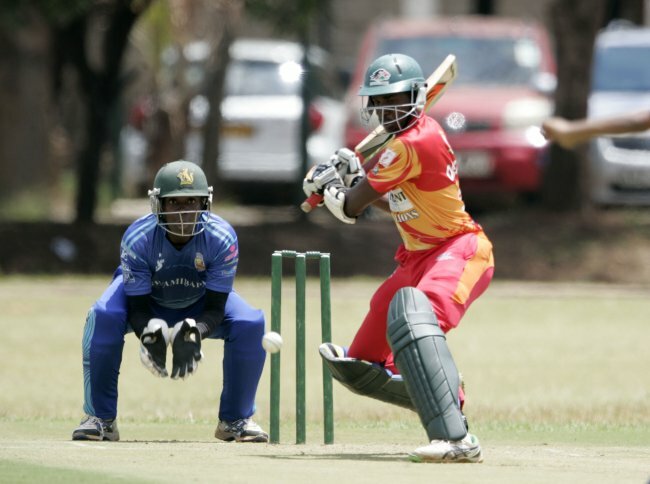 Only Maurice Ouma with 21 runs from 29 balls was able to stand the batting conditions that saw only four batsmen score more than 10 runs. In the chase the visitors faced a similar situation but held their nerves to seal the victory with 28.1 overs to spare. The home team found the going tough early in the inning when they lost their top three wickets for 31 in six overs. Nehemiah Odhiambo (3 for 19) was the architect of his former side's early collapse with the wickets of openers Alex Obanda (13) and Naman Patel (6). Irfan Karim too was caught behind off Nikhil Date to leave them on 31 for 3. Shem Obado made it 36 for 4 with the dismissal of Krishna Babu. Maurice Ouma and Emmanuel Bundi held up the inning briefly until in the 19th over when S.H Srinivas had Ouma caught behind with the board on 70. Ouma's dismissal opened up a middle order collapse as they lost their remaining five wickets for 31 runs. Three balls into the sixth wicket stand, Hiren Varaiya made it 72 for 6 with another catch-this time Bundi being caught at slips. Saumil Patel was also caught when Obado sprinted on his right to complete a brilliant catch. Mitesh Sangani and James Ngoche fought for close to 10 overs yielding only 27 runs until Ngoche was caught behind. A ball later Sangani was also back to the pavilion falling to Srinivas on 12. Lameck Onyango was the last to fall on a duck to end the inning on 102. The hosts started their defense of the low score on a positive note with Onyango picking up two wickets from three balls to leave the visitors on 2 for 1 after 2.1 overs. He had Prashant Srinivas caught and bowled off the last ball of the opening over before having Roger Mukasa brilliantly caught at mid on. It would have been three down an over later had Sangani not hesitated on Collins Obuya’s shot at deep mid wicket. Obuya and Vadada added on 28 before the home team picked up two wickets in three balls. Bhimji ended the Obuya/Vadada stand when he had Vadada caught before Bundi run out Manoj Sai for a golden duck with the scores at 32 for 4 after nine overs. Onyango had a chance to make it five in the 12th over when he dropped Obuya at mid wicket. Obuya and Neil Narvekar capitalized on the spilled chance to put on an unbeaten stand of 70 for the fifth wicket with Obuya scoring 62 including two sixes and a four in consecutive balls to seal a tenth consecutive win a third win in three consecutive matches over the former champions. Elsewhere, Rakep Patel hit 10 sixes in an unbeaten 106 as Kanbis easily beat visitors Sir Ali by by eight wickets. Rakep faced only 40 balls as he steered his side to victory with 35 overs remaining after national team coach Thomas Odoyo struck an unbeaten half century (76) as his side posted 199. After losing opener Dhiren Gondaria with the board on 37, Rakep put on a second wicket stand of 116 for the second wicket with Narendra Kalyan before Zaheed Abbas dismissed the latter on 59 from 30 balls that included five sixes and nine fours. With only 47 required, Nelson Odhiambo (6) could just watch in admiration as Rakep easily tossed away the bowlers to his fourth century of the season. At Cutchi Leva, Veer Dave also scored a century as Nairobi Gymkhana beat the home team by 104 runs. Dave scored 101 from 137 balls as Gymkhana posted 267 for eight. His knock included 10 boundaries only. At Sir Ali Obuya Academy registered third win of the season with 12 runs win over Sikh Union Nairobi.